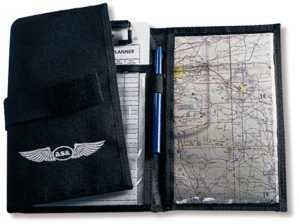 ASA Pilots IFR Tri-Fold Kneeboard. Strong aluminum tooled clipboard silkscreened with important IFR information fits into black 3-panel jacket. Has room for charts, books, flight computers, etc. For the pilot who needs to carry more, This Tri Fold Kneeboard holds the expertly styled IFR Kneeboard in a three panel jacket. The left panel has ample room for small books, papers and other items that don't fit elsewhere. The center panel holds the kneeboard under clear plastic with a pen/pencil holder and buttonholes on either side allowing a pilot to fold back one or both panels with the legband. The right hand panel contains a clear pocket for easy map viewing, and the elastic legband's Velcro closures fit any leg size comfortably. Black nylon with embroidered silver wings logo. Kneeboard is 6-1/2" wide x 9-1/2" high.